A full sitting of the Constitutional Court at the presentation of the Judiciary Annual Report for 2017/2018. (PHOTO:Office of the Chief Justice, @OCJ_RSA). 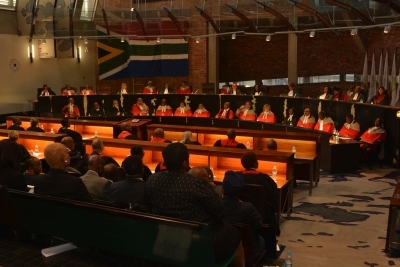 Chief Justice, Mogoeng Mogoeng has introduced a new level of accountability for the judiciary never before experienced in South Africa through the Judiciary Annual Report. Speaking in Johannesburg on Friday, Mogoeng explained that the three arms of state — the executive, parliament, and the judiciary — were all accountable to the people of South Africa. While the judiciary is held accountable by parliament for the spending and management of public funding, the discharging of its powers and decisions of the courts are an independent function. Chief Justice Mogoeng Mogoeng addresses the inaugural Judiciary Accountability Session (PHOTO:Office of the Chief Justice, @OCJ_RSA). In an interview with Gateway News after delivering his report, and hosting a press conference, the chief justice unpacked his faith-based position on moral authority and various other topics. Mogoeng has come in for severe criticism in the past for being an outspoken Christian, with some fearing he would impose Christian views on legal matters, or, at the very least, face a serious conflict of interest. However, he is very clear about what his job is as the highest judge in the land. “I never forget that I was probably the least qualified for the position of chief justice,” said Mogoeng. “I came from a very small high court with only six judges and there really wasn’t much from my own point of view to justify my elevation to the position of chief justice. Mogoeng draws from God’s Word for the discernment to do his work effectively: “I follow the strict divine regime of studying the Word of God daily, of praying daily, and embarking on protracted fasts as often as I’m able to, so that I stay connected. “The result is that when a case that involves things that are even against the Word of God comes here, the Lord has helped me to realise that, ‘Look, you accepted this position knowing what the Constitution of South Africa looks like, knowing what the laws of South Africa look like, so don’t try to make your own laws that will suit your Christian faith. Don’t corrupt the constitution and the law. Just apply the law the way it is supposed to be applied, in line with your affirmation of office or your oath of office. Among the measures announced by Mogoeng in his address at Constitution HIll were a move to introduce “win-win mediation” at courts, a push for judges to not write “scholarly” judgements but rather to deliver their judgements expeditiously, a drive to simplify the administrative burden on the courts by making English the single language for record-keeping (although people will still be able to testify and bring evidence in their language of choice), and an ongoing effort for the police to only bring matters to court that are ready for trial and have been sufficiently investigated. He also wants to introduce an electronic document-filing system to cut costs and improve access to justice. Lord we ask that you raise up more Godly people like Mogoeng Mogoeng in our nation. Men and women who fear God more than man and who are not driven by greed and wrong motives.